Two King Suites! Morning Glory! Endless View! Close to Town. All paved roads. Morning Glory is a Fantastic Small Cabin High atop Godfrey Mountain with Glorious views of the North Georgia Mountains and Apple orchards below. Take in gorgeous sunrises from the upper and lower decks, furnished with swings, rockers and a picnic table. Gates on the deck protect pets and children. 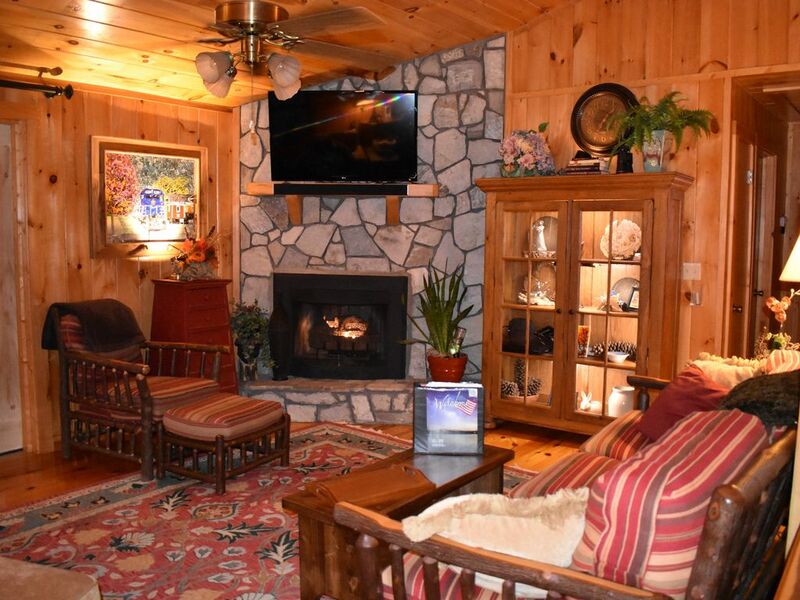 Indoors the cabin is beautifully furnished with mountain rustic pieces, antiques and comfortable upholstered recliners. Morning Glory is fully loaded with first-class fixtures, furniture and electronics. Big screen LED TV's, 3D TV in game room, Directv, DVR, 3D Blu-Ray DVD Player, Wi-Fi High Speed Internet, Pool Table, Ping Pong Table, Poker Table board games. This property is across the street from our other larger cabin, Eagles Rest (VRBO.com/188378), where we have 96 5 star reviews. The Main floor has a well equipped kitchen with knotty pine countertops and all the small electric appliances you need for meal and drink preparation. All new stainless appliances! The dining room has seating for 6. The great room has a 55” flat screen TV, stone fireplace with gas logs and atrium doors open to endless mountain high view! There are two master suites, one with a king size pillowtop bed and one with a king size memory foam bed. In addition to the two full bathrooms connected to the bedrooms there is a half bath off the living room. The lower level has a Pool Table, Ping Pong Table, Poker Table, small dry bar, a seating area focused around a flat screen 3D TV, and Blu-ray DVD player. There is a trundle bed and a full bathroom and laundry facilities on this floor. There is a private hot tub located on the patio outside on the lower level as well as a hammock, swing and rockers. Natural rock fire pit is ready for your camp fire, wood is provided. Small dogs are allowed with prior approval of owner. Dogs must be on a leash when outside the cabin. All paved roads and paved parking on the same level as main floor with no stairs at entry, and parking on road with easy stairs to front door to cabin, 5 minutes from downtown Historic Blue Ridge and 2 minutes from Merciers for the best fried apple pies! Morning Glory is only a short drive from the Scenic Blue Ridge Railroad, Aska Adventure Area, Horseback Riding, Ziplines, Kayaking, Tubing, Fishing, and special event in the Park. 1996 Olympic Ocoee River White Water Rafting just 15 minutes from cabin. Antique and specialty shopping abounds. You will want to come back to this Awesome cabin again and again! SECURITY CAMERAS - This property is protected with outside security cameras. These cameras are used to protect the property from potential break-ins and theft. There are NO cameras inside the house or viewing the hot tub or other guest gathering places. The fire pit, driveway and external approaches to the cabin are visible. Keywords: Cozy Cabin, pet friendly, 40 mile mountain view, pool table, sleeps 4-6, close to town, close to attractions, no stairs at entry. Two of us are retired, one from Goodyear Tire and Rubber in Gadsden, Alabama. The other from the Alabama Institute for Deaf and Blind in Talladega, Alabama. Our children are co-owners. We love to hike and ride along the scenic highways. This property has the most beautiful views! A must see to appreciate! It is across the street from our other vacation home, Eagles Rest (VRO.com/188378). Morning Glory gives you the secluded feeling of forest living yet it is only 5 minutes from town. Dominoes will deliver and you are only 1 mile from Merciers apple orchard where you can get the best fried apple pies around. All roads are paved and no extremely steep hills. Gorgeous Views of mountains, valley and apple orchards. Fantastic Sunrise vista!! A relaxing stay at Morning Glory is just what our family needed. This warm and inviting cabin has it all. The inside decor is comfortable and pleasing to the eye. The game room is really more like a game suite...pool, ping pong, poker table, shuffle board, hot tub AND a 3D tv-Wow! As wonderful as all of that is, the absolute best part of the trip was waking up each morning to a beautiful sunrise. Magnificent! Finally, this amazing retreat is close to everything...great restaurants, shops and fabulous adventures. We really enjoyed exploring the many trails complete with “take your breath away” waterfalls. Thank you, Cathy. We came home feeling refreshed and renewed. We will definitely be back! This is the second time we have stayed at Morning Glory and once again it was just perfect. The first time we stayed, the driveway was still gravel and that was the only drawback. Now, with the paved driveway, everything is great. Love the porch and the veiw and we sit out there for hours. Everything in the house is always really clean. Lovely, well-appointed cabin with a wonderful view! We stayed at the Morning Glory for 3 nights with our 2 young adult sons and one fiancee plus 2 small dogs. The kitchen was very well stocked with quality items as was the rest of the house. We really enjoyed our stay here! Fantastic cabin with great Mountain views! Great cabin with amazing views! We will definitely be back! Thank you Cathy! It was perfect! So glad we stayed here!! Was a beautiful house with a GREAT view! Felt so comfortable there :) will be back!